Feeling lucky??? You will be with these soaps.....lucky AND fresh!! These soaps make great favors for: Weddings, Bridal Showers, Baby Showers, Housewarming Parties, Anniversaries, Birthdays, Hostess Gifts, special occasions, etc.! 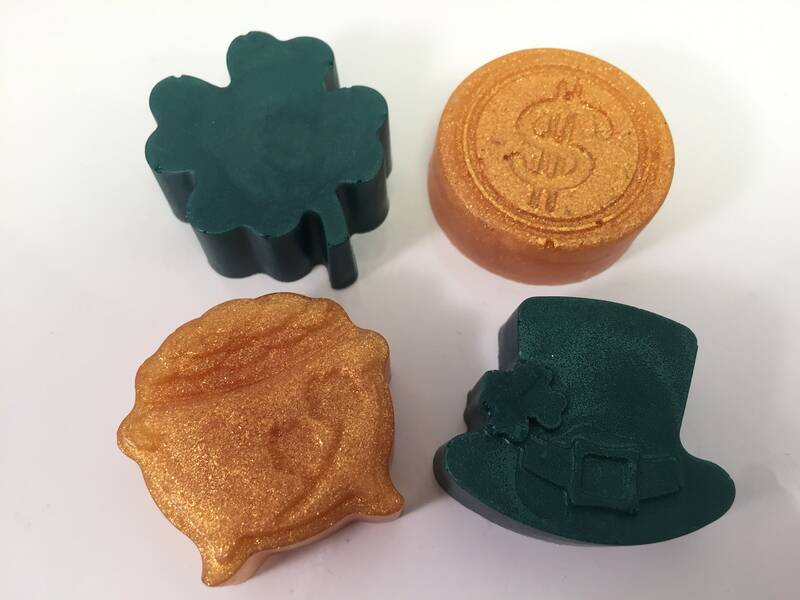 This listing is for one (1), set of 4 soaps (1-Four Leaf Clover, 1-Pot O' Gold, 1-Leprechaun Hat, 1-Gold Coin). Soap will come packaged in a cellophane bag with ribbon. Four Leaf Clover: 1.5" Diameter, 0.75"Thick. Gold Coin: 1.5" Diameter, 0.75"Thick. Pot O'Gold: 1.75"L x 1.5"W x 0.75"Thick. Leprechaun Hat: 1.75"L x 1.5"W x 0.75"Thick.